After my It's Beginning To Look Like Christmas post the other week, I had a request for a tutorial for the ribbon Christmas Tree featured on the bottle bag. I made the tree up into a simple hanging, but also another bottle bag to show the possibilities for this design. Changing the width or type of ribbon, number of 'branches' in the tree, varying the buttons added or even adding mini button decorations make this an ideal starting tutorial limited only by your imagination. My hanging is a simple one whipped up ready for this post & as a special gift, but you could add many more embellishments if you wanted. The lighter green bag has wider ribbon so the tree seems much larger than the one on the darker green bag on the right side. 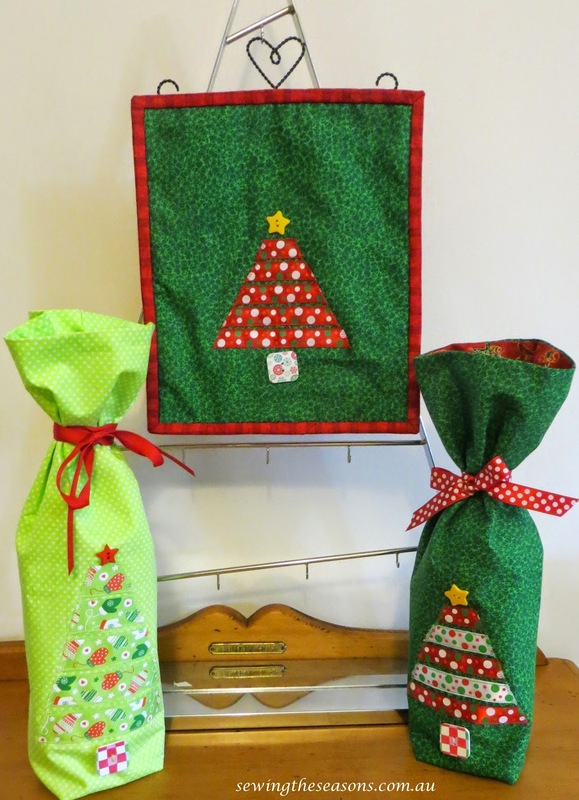 You can also follow my tutorial on Bottle Gift Bags if you wanted to sew your tree onto a bottle bag. Cut to required size of project choice - NB if wanting a border on hanging, add now before adding wadding or pellon. Iron on or pin on the pellon, interfacing or wadding on back of main piece of fabric. 4 1/2", 4", 3", 2 1/2", 1 1/2"
Continue this step until shortest top strip, trim ends on angle to have top measurement 1". **If adding extra 'branches' to your ribbon tree, you will need to work out measurements according to required number of 'branches' & you will need more ribbon. Mark centre of fabric piece, pin ribbons 'branches' on fabric - I found it best to only leave 1/8" between each 'branch' to ensure neater finish but choice is yours. Trial a zig zag stitch on your machine, noting as in picture the width & length of stitch selected & choose a smallish, neat looking finish = you will use the zig zag to secure the ends of the ribbon 'branches'. If making bottle gift bag, complete bag, attaching ribbon tie as per tutorial. Picture shows examples of optional finishes such as border fabric, ribbon border or binding. For this tutorial, I chose a simple binding option. Attach hanger, ready to hang or give. I would love to see any ribbon tree creations you make as well. thanks to share this post. I have got much clear idea regarding from this piece of information.